For strength and agility gains, take things to the side. The majority of our daily movement is forward and backward. Our workouts tend to be no different: Most exercisers focus primarily on linear training. But that one-dimensional approach gives short shrift to muscles like the abductors and adductors, limiting agility. What’s more, when your body isn’t accustomed to lateral motion, it takes more effort—a serious disadvantage whether you’re playing tennis or skiing. The solution to the imbalance is simple, though: add more side-to-side movements to your workout. 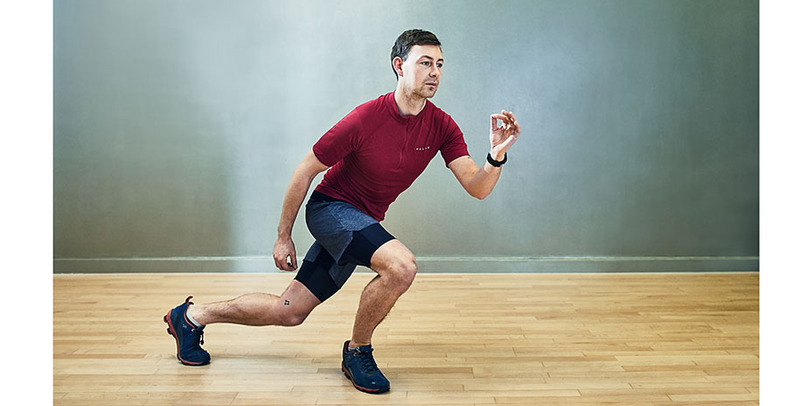 “Exercises like multi-planar lunges are great for teaching the body to move in all directions,” says Matt Delaney, a Tier X coach at Equinox Columbus Circle. Ready to work all the angles? Try the lateral-training moves in the slideshow below. Cherry-pick one or two for your regular routine; or, do them all for a quick lower-body workout. Stand with feet about hip-width apart, in a quarter squat position, knees slightly bent, elbows bent by sides, a band around your quads just above the knees. Keeping your hips back in an active ready stance, as if you are reaching to sit in a chair, back tall, abs engaged and chest open, take a step about a foot to the right with right foot, pushing band out to side, landing on a flat foot, as you drive left arm forward, right arm back. Step left foot in so feet are back to hip-width apart again, keeping resistance in band, driving right arm forward and left arm back. Continue this sequence for 8 to 10 steps to the right side; switch directions and repeat in reverse until you return to start. Do 16 to 20 steps total. Stand with feet together, knees bent, holding weight at either end at chest level, elbows bent. Push off right foot and jump to left, bringing right foot slightly behind left and lowering weight toward floor. Push off left foot to return to start for one rep. Go for 30 seconds. Switch sides; repeat for another 30 seconds. Arrange at least six hurdles in a row, setting them about 2 feet apart from one another. Facing forward, shuffle laterally down the line, lifting your right knee high and stepping between the first hurdle, then lifting your left knee high and stepping your left foot down. (Each foot should touch down only once between each hurdle.) Progress down the line; sprint back to start. And do the opposite direction. Keep alternating 45 seconds of shuffling with 15 seconds recovery, then repeat for a second and third set, trying to achieve greater quickness with each effort. Facing the anchor point of a TRX, extend arms to shoulder height, palms facing down. Step right foot out to the side. Bend the right knee and sink weight into the right hip. Left leg stays straight. Spring off the right foot and cross the right leg back behind the left at a slight diagonal. Bend both knees to complete a curtsy lunge. Continue for 30 seconds with the right leg before switching to the left side.